Cashew, a 14-year-old labrador retriever owned by Terry Burns in Middleburg, Pennsylvania, is both blind and deaf. 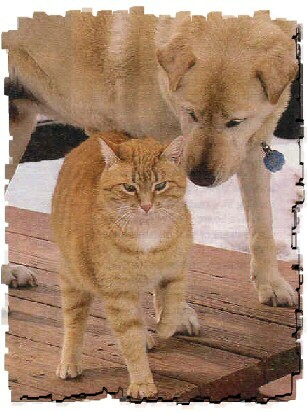 Her best friend is a 7-year-old red tabby cat named Libby, who has become Cashew's seeing-eye cat. Libby guides Cashew around obstacles, leads her to the food dish, and sleeps next to her every night. The only time they are separated is when Terry takes Cashew for a walk. Cashew's owners know that without this cat, Cashew would be lost and very, very lonely. Libby is one animal who knows what needs to be done and does it, day in and day out for her friend.